This tour is currently only offered as a private tour. 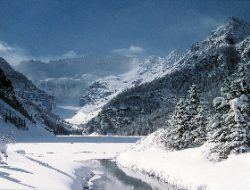 The unexplored mountain wilderness attracted the first tourists to Banff National Park. View the powerful landscape first hand on your way to Lake Louise and Bow Lake. Learn about our mountaineering history and how a tragic accident at Lake Louise shaped Canadian Mountain Culture. Finally, visit the source of the Bow River and Num Ti Jah, an historic hunting lodge built in the 1900's. There are many photo opportunites! Combine the Banff Wildlife Sightseeing Tour in the morning for savings.